Supernova 2005E, discovered five years ago by the University of California, Berkeley’s Katzman Automatic Imaging Telescope (KAIT), is a calcium-rich supernova that defies categorization, leading astronomers to speculate that it may hint at new and unusual physics. Filippenko is coauthor of a paper in the journalNature describing SN 2005E and arguing that it is distinct from the two main classes of supernovae: the Type Ia supernovae, thought to be old, white dwarf stars that accrete matter from a companion until they undergo a thermonuclear explosion that blows them apart entirely; and Type Ib/c or Type II supernovae, thought to be hot, massive and short-lived stars that explode and leave behind black holes. The team of astronomers present evidence that the original star was a low-mass white dwarf stealing helium from a binary companion until the temperature and pressure ignited a thermonuclear explosion that “blew off” at least the outer layers of the star, and perhaps annihilated the entire star. Incredibly, the researchers calculate that about half of the mass thrown out was calcium, which means that just a few such supernovae every 100 years would be enough to produce the high abundance of calcium observed in galaxies like our own Milky Way. However, a team of researchers from Hiroshima University in Japan argue in the same issue of Nature that SN 2005E’s original star was massive – between 8 and 12 solar masses – and that it underwent a core collapse similar to a Type II supernova. SN 2005E, which exploded about 110 million years ago in the spiral galaxy NGC 1032 in the constellation Cetus, ejected only a relatively small amount of matter, estimated at 30 percent the mass of our sun. 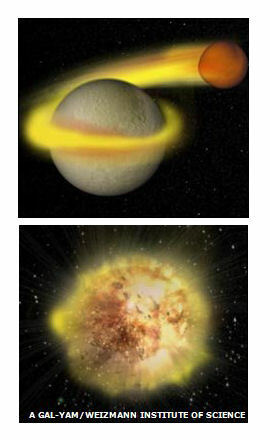 The fact that the galaxy in which the explosion occurred was old with few hot, giant stars, led the researchers to the conclusion that a low-mass white dwarf was involved. In addition, the newly discovered supernova threw off unusually high levels of the elements calcium and radioactive titanium, which are the products of a nuclear reaction involving helium rather than the carbon and oxygen involved in Type Ia supernovae. 2000 Press Photo Peter Facinelli, Robin Tunney, Lou Diamond Phillips "Supernova"